Simple decadent gluten-free chocolate hazelnut thumbprint cookies! Made with almond flour, rolled in crunchy hazelnuts and filled with silky chocolate ganache. Can I tempt you with one last irresistible nutty chocolate cookie recipe? I promise it will bring world peace, or at least a few moments of bliss. If you are looking for a decadent cookie made to impress, this recipe was made especially for you! It’s cookie madness during the holiday season (no complaints here! ), so I’m adding just one more sweet treat to the mix. 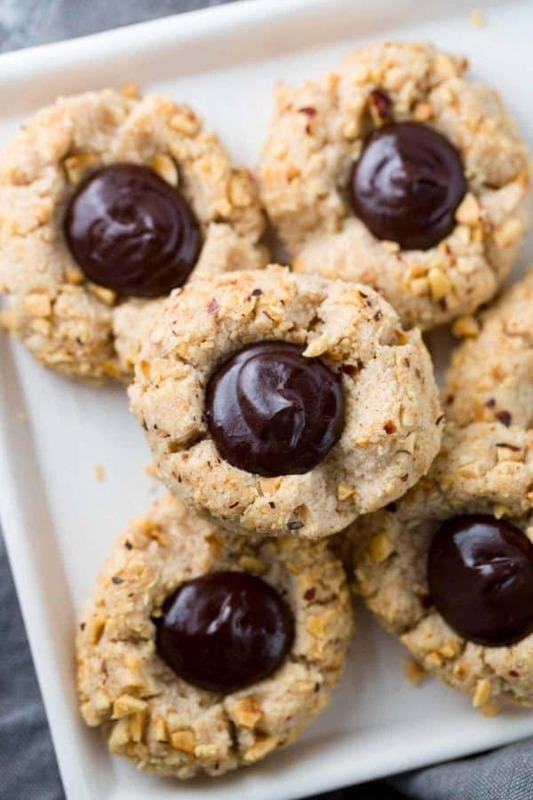 These chocolate hazelnut thumbprint cookies have a special ingredient that makes them gluten free and melt-in-your-mouth. If you think you can handle the goodness, let’s get baking! Almond flour is a handy ingredient for gluten-free baking. With some experimenting, you can create a wheat-free cookie that can mimic the texture of flour. In fact, they have been traditionally used in French macarons and Mexican wedding cookies, yum! There has been an explosion of recipes using this alternative flour for baking like in cookies, muffins, and quick bread. Meal vs. Flour– You can find almond meal and almond flour in the market. The meal is ground almonds with the skins, and the flour is finely ground blanched almond with no skin. Use almond flour in baking as it’s slightly denser and less oily. Measuring– Almond flour is much denser than normal flour, so use a spoon to scoop into the measuring cup and use a knife to level it off. Don’t overpack! Browning– Nuts brown quicker than wheat flour, so you can use foil to tent the baked item if you notice it changing colors too quickly. You can also try baking at 25°F lower in temperature and for a longer duration. Cooling- Cool your baked items completely to allow it to hold together better. When warm, the product is more brittle and crumbly, especially with cookies and crusts. The base of these chocolate hazelnut cookies uses finely ground almond flour which adds a nice nutty flavor and tender texture. It’s a simple combination of almond flour, powdered sugar, salt, almond extract, and cinnamon. That’s it! Before baking, roll the dough balls in crunchy chopped hazelnuts. Add an indent in the center, right before baking and watch them transform into buttery crisp cookies! Sometimes I dream about chocolate, how about you? I pretty much try to add it in any baked good I can, like in my chocolate dipped almond shortbread cookies. For this hazelnut thumbprint cookies recipe, I wanted a super luscious soft chocolate ganache filling that would be similar to the center of chocolate truffle candies. Instead of cream, I used coconut milk at about a 2:1 ratio of bittersweet chocolate to milk. You can use cream, but I wanted to try a dairy-free option. These tasty cookies have a wonderful roasted hazelnut flavor! When you take a bite of the chocolate center and nutty cookie together, it’s like a Nutella explosion of flavor. One is just not enough! When two amazing ingredients like chocolate and nuts are combined, the undeniably yummy combo is a big win! The best part is you can share with your loved ones who have gluten-free restrictions. How else have you used almond flour in your baking? I would love to hear about your tasty creations! Can almond flour replace all-purpose flour? Yes! Unfortunately, there are no set guidelines for almond flour substitution for all-purpose flour. This just means more fun practice and experimenting with different recipes! The composition of almond flour differs in texture, fat content, moisture, and weight. Each recipe will need a different conversion, so start by using the same amount as stated in the recipe and tweak from there. The more almond flour you add, the thicker the batter will be. In a small pot heat, coconut milk over medium-low until the edges start to bubble. Turn off heat and add in chocolate chips. Stir until completely melted and combined. Transfer to a piping bag or small resealable plastic bag. Allow to come to room temperature as you prepare the cookies. Chop hazelnuts into small pieces, add to a medium sized bowl. Set aside. Mix almond flour, softened butter, powdered sugar, cinnamon, salt, and almond extract together in a mixer on medium speed until a cohesive dough form, about 60 to 90 seconds. Scoop 2 tablespoon size dough, roll in to a ball and then roll to coat in chopped hazelnuts. Arrange the balls of dough about 1 1/2" to 2" apart. Use your thumb to create about an 1/2-inch wide indent in the center of each cookie. Bake the cookies for 10 to 12 minutes, until they start to turn light golden brown on top. Remove the cookies from the oven and cool them on the pan for 10 minutes. Transfer them to a rack to cool completely. Cut the tip off the piping bag or resealable bag. Fill the center of each cookie with chocolate ganache. Allow to cool until the centers are shiny, soft and solidified before serving. Store cookies in an airtight container for up to 2 days. Beautiful looking Jessica. I just sent it to my sister. She is looking for Gluten free recipes for Christmas Eve. They want an Italian feast thus my query to you on Instagram about gluten free Italian dinner or appetizers. 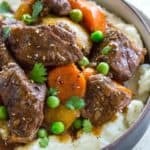 I found your blog through Instagram, and I’ve been loving trying your recipes! I recently made these cookies, and though they were super tasty…the ganache didn’t solidify as much as I thought it should have. I’m not the greatest baker in the world, so I’m sure I messed up somewhere haha. Do you have any suggestions for next time? Thanks so much! Nice to meet you Katie! Thank you for following and trying the recipe 🙂 Next time you can refrigerate the cookies for a quicker set up of the chocolate. What kind of chocolate did you use? You can also try heavy cream next time, that may help it set up better as well. Hi Katie! I wonder if you use dark chocolate (I used 60% cacao from Ghirardelli), would help the chocolate set up a little better since there is more solids. Let me know how the next batch goes! Thanks for this recipe! I wanted to ask, what should the texture for this cookie be, ideally? I made the cookies a day in advance, and stored them in an airtight container. I noticed the texture was on the crispier side the day I baked them. The texture seems to be softer the day after. Hi Sharon! Thank you for the feedback 🙂 I have noticed the same that the texture changes the next day when stored in a container. The reason is that the moisture in the cookies equilibrate in the air space in the container, causing the surface of the cookies to pick up that moisture and soften. Especially since there is no flour and coconut is used, there is no additional protein in the cookies to keep them a little more crunchy over time. So I would recommend maybe making the dough a day day in advance, and then baking them the same day if you like it more crispy. I hope that helps! Thanks so much, Jessica! That’s very helpful to know, and thank you for the tip! This cookie was a hit with my friends, and I also had great success with the Mexican Hot Chocolate Cookie recipe. Thanks so much for these wonderful recipes and explaining the science behind them. As a nutritional sciences graduate, I appreciate your culinary science perspective on cooking! You are so welcome Sharon! I’m so thrilled to hear that you had success with both cookie recipes 🙂 I love sharing my culinary science knowledge with you and think it’s so awesome that you have a nutrition background! Please reach out with any questions you have, cheers!